The Depart of Justice issues a report on vaccine injuries and deaths every quarter to the Advisory Commission on Childhood Vaccines . This March 5, 2015 report states that there were 117 cases for vaccine injuries and deaths compensated from 11/16/2014 to 2/15/2015. 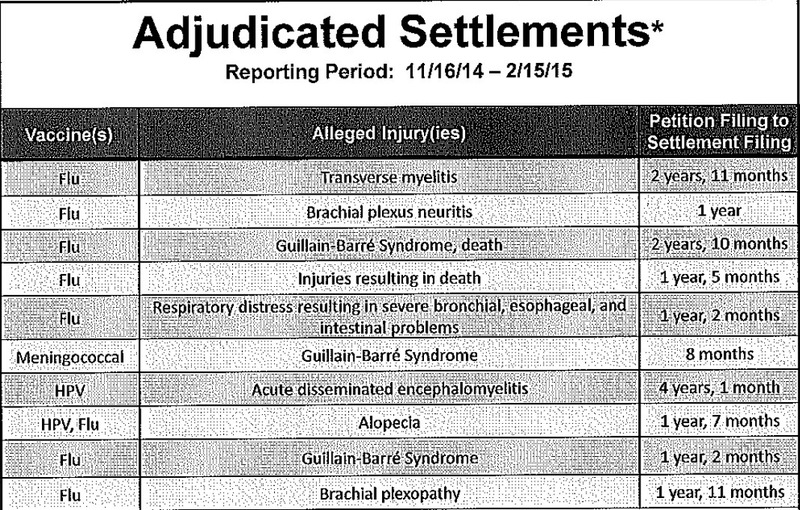 92 of the settlements were listed in the report, giving the name of the vaccines, the injury, and the amount of time the case was pending before settlement. Five of those settlements were for deaths linked to vaccines, with three deaths related to the flu shot. 73 of the 92 settlements were for injuries and deaths due to the flu shot, and the majority of flu shot injuries were for Guillain-Barré Syndrome. 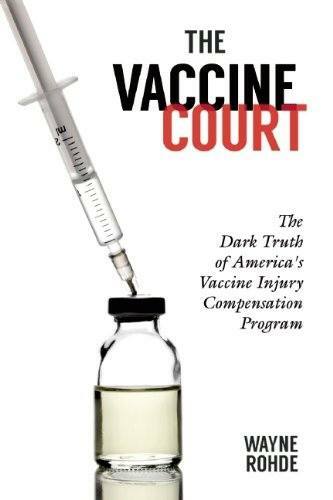 In November of 2014 the Government Accounting Office (GAO) issued the first report  on America’s “Vaccine Court,” known as the National Vaccine Injury Compensation Program (NVICP), in almost 15 years. Most citizens of the United States are not even aware that there is something called the National Vaccine Injury Compensation Program, and that if you suffer harm or death due to a vaccine, that you cannot sue the manufacturer of the vaccine, but you must sue the Federal Government and try to obtain compensation from the Vaccine Injury Compensation Trust Fund, which is funded by taxes paid on vaccines. The November 2014 GAO report criticized the government for not making the public more aware that this program exists, and that there are funds available for vaccine injuries. Therefore, the settlements represented by vaccine injuries and deaths included in the DOJ report probably represent a small fraction of the actual vaccine injuries and deaths occurring in America today. The unified message presented by the U.S. mainstream media and certain government agencies is that vaccines are safe. This is a lie. Vaccines are dangerous. People are injured and killed by vaccines, and the quarterly reports from the DOJ, which probably reflects a very small percentage of the actual cases, clearly reflect that inherent danger. So many people were being injured and killed by vaccines in the 1980s, that the pharmaceutical companies petitioned Congress to pass legislation giving them legal immunity from cases in civil court. They basically blackmailed Congress by threatening to get out of the vaccine business if such legislation was not passed. Congress obliged in 1986, and today we have the NVICP, while new vaccines entering this “protected” and “guaranteed” market have soared. The largest purchaser of vaccines is the CDC, purchasing over $4 billion worth of vaccines a year . In addition, the U.S. Government holds patents on some vaccines, and earns royalties on them , such as the Gardasil vaccine. Julie Gerberding was in charge of the CDC from 2002 to 2009, which includes the years the FDA approved Gardasil as a vaccine. Soon after she took over the CDC, she ties to the vaccine industry . Gerberding resigned from the CDC on January 20, 2009, and is now the president of Merck’s Vaccine division, a 5 billion dollar a year operation, and the supplier of the largest number of vaccines the CDC recommends (article here ). The U.S. government has massive conflicts of interest where it concerns policies related to the vaccine industry. Before you make a potential life-changing decision for you or your children by agreeing to be vaccinated, do your own research. The government cannot be trusted on vaccine matters, and the mainstream media and many doctors are also not doing their own research related to the vaccine industry. Be informed and educated regarding vaccines, before you become a statistic among the vaccine injured and dead. Previous DOJ reports on vaccine injuries and deaths . 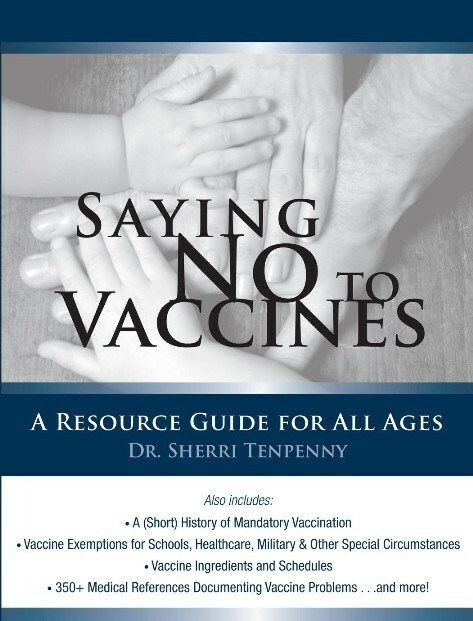 Saying NO To Vaccines By Dr. Sherri Tenpenny You have legal options!